Just a heads up, I have a good chunk of my holiday get-together’s coming up this weekend, including a trip out of town for New Years Eve. There may be a chance of not having a comic ready on Monday, but I will try my best to avoid that. This was originally gonna be two comics, but I compressed it a bit. Good news, Keisha. There is a good chance that you will not be found guilty of taking Selkie’s shirt once a timeline is put in place proving that you were in the gym when the shirt theft happened. The bad news, the teachers probably do not care enough to make a timeline. There is also a good chance you will still get punished unless you turn in the real thief, and thus lose a friend or two and be labeled a “snitch”. Moral of the story, choose your friends and enemies carefully. Well, plus there are witnesses in the classroom that Heather was holding the shirt and then Keisha started speaking out on Selkie’s behalf and grabbed the shirt. Plus, Amanda does hold a grudge. Oh dear, oh dear, oh dear. You’re making us care about the internal politics and power struggles of a class of nine-year-olds. Well done. Classroom witnesses are notoriously unreliable. Just being brought in to be questioned makes them react as if they’re the ones in trouble, and thus will do everything they can to protect their own butts. At the expense of whoever else is handy. Keisha’s going to end up in trouble alone for this. 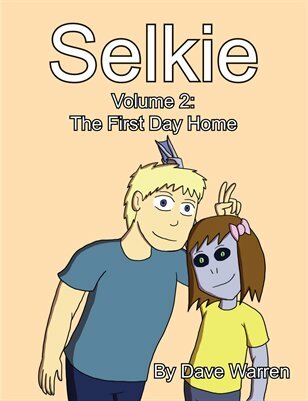 keep in mind, one of the witnesses is Selkie’s best friend. We haven’t seen a lot of Georgie yet, but I have faith in him. I don’t think he’s going to stand by while someone who was defending Selkie gets punished and the ones who were being mean to her get off scott free. Well, we also don’t know for sure how many of the classmates heard Amanda and Keisha’s conversation. George sits in the back and they’re in the front, I think, right? It’s entirely possible he isn’t even aware that they took the shirt. For all that I love Georgie, he is not exactly a *reliable* witness, is he? I could see Heather taking the blame otherwise everyone’s going to hate her even more and be completely without friends. On the story: Frak, the desperation of some people… Sigh. On the delayed comic: don’t forget to check out my blog post on Shards, and don’t sweat it! 🙂 Have a fun holiday! But that’s what she meant to do anyways? So what’s the problem then? No! NO! Those teachers had better d**n well investigate! I remember the “someone must be seen to be punished and the most obvious candidate means we don’t break our lunch hour” mentality only too well. It’s the mentality that means they only ever see the retaliation in a fight, and immediately blame the fight on the retaliator. It’s the mentality that puts the blame on the one holding the note, not the one who passed it. It’s the mentality that makes the whole class pay when there’s no-one nice and obvious to blame it on! Ahem. Congratulations on a very involving comic, Dave. I have many of those memories myself. It’s hard to forget. I feel sorry for her – she can’t tell on her friends. And neither can anyone else in the class for fear of being ostracized, but someone like George might be able to tell the teacher in private. Yeah, but Selkie didn’t see who took it. Even if she doesn’t want to admit that she took her shirt off and hung it over the stall door, “somes jerks cames ups behinds mes ands GRABBEDS MYS SHIRTS ANDS PULLEDS ITS OVERS MYS HEADS ANDS RANS OFFS WITHS ITS” implies “I didn’t see who it was”. That was before SHE was caught with the shirt in her hands. Trying to tell on them now would just appear as an attempt to shift the blame. Although, I have a feeling that Heather may soon be found out, since as far as we know, she was the only person who was out during the dodgeball game and who could have gotten away with sneaking out unnoticed saying as the teacher had to supervise the rest of the kids. So basically, both Amanda and Keisha (as well as Tony, since he also was a potential suspect) have an alibi. Heather does not. Maybe Heather will own up to it. I’m thinking she could see how much trouble Keisha is in and at some point before punishment becomes too terrible, she steps in and admits that she took it, and explains why. The reason she would do this selfless thing and take punishment could be because she thinks that by doing so, she will get back in favor with her former friends. Are you kidding? Popular kids in K-12 are everything about humanity that allowed the Holocaust to happen turned up to 11 and rolled up in a smirking ball of glitter. Poor Selkie! I have a feeling that no matter what, Keisha’s gonna take the blame for this. 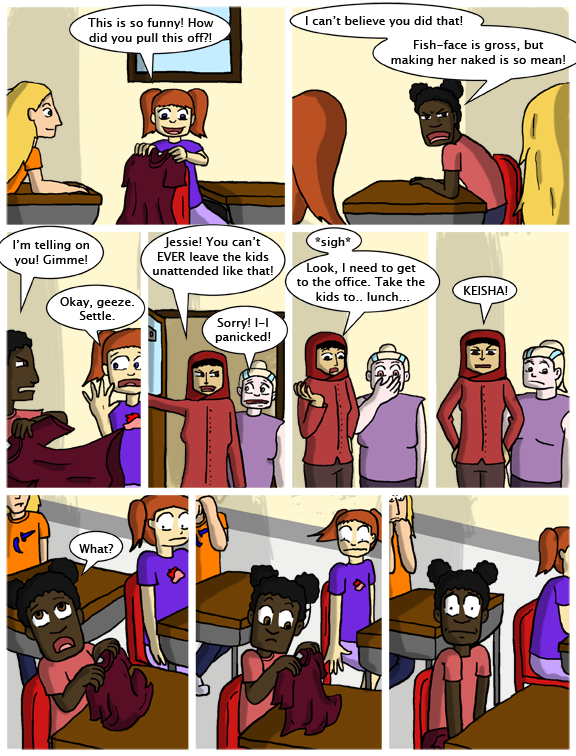 I think this comic shows that Keisha has the most morals out of the whole little brat trio. Even though she doesn’t like Selkie she still realized it was going too far to take her shirt. She even stood up to her friends about it. That’s some courage and guts right there. I don’t feel for Amanda, but I think she’s got a really good friend that could possibly help her change for the better as the story progresses. Also I didn’t see this twist happening since I assumed all three girls were jerks. Good job keeping it interesting, Dave. It’s always refreshing to see characters with depth that are more than just a cardboard cut out of a stereotype. I think it’s a big part of why this comic does so well. As someone who has time and time again been punished for being bullied, I must say that THOSE people- the people who blame the victim without any regard for the circumstances- are the festering cancerous pustules eating away at society. Well said, DataWog. To fail the child is to fail the adult. All we can do is learn our own worth, and remind our fellows of theirs. If we can’t claim to be better than those who bullied us, who were just children themselves, we are certainly better than the teachers who failed to give us justice. Sometimes you get someone like me: Bullied left and right, punished for retaliation, new school left and right, pushed aside; but instead of depression, anger builds. It builds to the point when finally it explodes and one bully finds himself becoming an example to scare off the rest of the bullies and he get’s severely injured. Then after this child learns the power of anger he starts to hate everyone around him and becomes misanthropic. Now, I sit here, with my dog, living a normal life, except for being anti-social. Sometimes you pull out of the gate and still become a reasonable, healthily minded person with a few issues. Some people aren’t that lucky. And the authorities demand that you account for your behaviour, but it wasn’t just one thing or even that one person that drove you to it. You can only say, “It was everything, as far back as I can remember”. If you were older or the authorities were more perceptive, you could tell them that bullying isn’t an incident, it’s a regime, a sick lifestyle, and eventually something had to give. But at that age, you don’t even have the vocabulary. Even if you can remember some specific incident, when you tell it in isolation it just seems so trivial. So once again, you have retaliated and you are to blame. Ah, Gallows, I was lucky and pulled up short of that retaliation, at the cost of practically droping out of school. Apologies to Dave for opening the floodgates, here. I think the character of Selkie is a mirror to the experiences of many readers- quite an achievement. to make me safer than a social psycho it seems. I just don’t go seeking people out. Parents do it, Teachers do it, Counselors do it, Clergy do it, eventually even us poor bullied kids believe its our own fault, and are STILL powerless to make it stop – many of us end ourselves because its the only thing we can really control. Horrible. I need to go hug somebody… and a tissue. Ah, Madrigorne, I would supply that hug, if I weren’t intensely uptight and British. At least I’d proffer a well-laundered handkerchief. Parents I can forgive, for who is a professional parent? But teachers, counselors, clergy, any professional in loco parentis, must bear the responsibility for the lives they ruin- or even the lives they simply mar. We remind ourselves that self-harm is continuing the work of the bully, and suicide is no reproach to the authorities who failed us, who couldn’t have cared to begin with. It is better revenge to live, and live well if you can manage it! It wasn’t until I was – twenty or so, working as a professional babysitter, that I started looking back on my on-again off-again journals that I’d written as a child that I realized how poisonous my childhood was, and how the ‘adults’ in my life added to the toxicity with their attitude. I won’t let it happen to another kid if I can help it, and I stop it dead whenever I see it – and it doesn’t matter who I yell at if it stops bullying of a child. I’ve yelled at our city Mayor for not defending his kid at Chucky Cheese, and dried her little girls tears my own self. I’ve yelled at my Aunts and Uncles, I’ve yelled at the Head of the ROTC chapter here, and they all hang their heads in shame, because what they do is wrong, and even they can see it. But I don’t get a feeling of righteousness, and it doesn’t make me feel warm inside – its a cold sick tight chested dread, same as when I was a kid. I hug even uptight British folks, it usually surprises them and makes them laugh – then they hug me back. I had to get therapy for something like this when I was about twelve. It was very helpful in stabilizing my emotional state. I learned the value of a good cry long ago. Another webcomic whose name I forget referred to it as a “soul-vomit”, as in purging out the twisting feeling in your throat that threatens to choke off your positivity. Look closely at Keisha’s eyes in the last panel. You can actually see the tears welling up. Nice touch, Dave. I have to say the quality of believable reactions is going to go down if she just sits there and takes it. No one in my class’s would do that growing up and I don’t know a single real kid who would not scream at the tops of their lungs if accused of something they did not do. Considering how she said she was telling anyway it’s kind of flat and out of place if she just dose nothing. Remember that she doesn’t have parents, no real siblings, no real home. That does things to a child’s psyche – she’s probably more emotionally attached to Amanda & co. than she is to anyone else. And if you really care about someone, REALLY care for them, you’ll do just about anything to protect them, possibly including taking the blame. At least for a while – the length of said while probably depends on the severity of the issue. Besides, even if she managed to implicate Heather, she’d likely have to share the blame. I’m hoping Amanda will defend her, so that together they’ll manage to convince the adults it really was Heather, but we’ll see. Anyone care to place wagers on whether or not Amanda will immediately tell keisha off for “doing it” to look good infront of the teachers? Okay, that is just unfair. I’m really kind of hoping that Heather will admit to doing it to try and get in good graces with the girls again. On a related note, I really like Keisha. She’s a lot nicer that either Amanda or Heather. It should have been pigtail girl!!!!!!! !